The Department of Homeland Security isn’t just embroiled in a fight against terrorism, drugs, and illegal immigrants crossing our borders. They’re engaged in a fight against our own news media. Or, what President Trump refers to as “The enemy of the people.” But is there any truth to the reporting from news sources? The agency which was created with the sole purpose of protecting the United States against attacks from within and without, is now itself being attacked from within by the very people it protects. 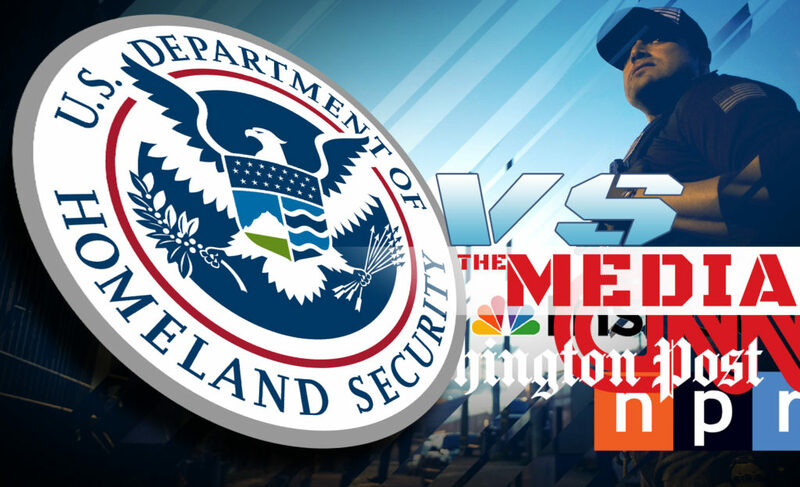 The DHS has devoted an entire section of its website to combating and calling out false, half reported, or exaggerated news stories that put law enforcement agents at risk by setting the record strait. In focus, is the page that launches their myths vs. facts section, with an outright jab at irresponsible news reporting, opportunistic congressmen, and what they describe as other groups. Given the copious legal attacks launched against the DHS by the American Civil Liberties Union, it isn’t a huge leap to conclude whom the aforementioned “other groups” just might include. With a quick jaunt around the web you’ll find a plethora of news articles outlining in detail the alleged mistreatment of illegal immigrants by ICE agents. What isn’t as prevalent are reports given in context outlining just how overblown the stories really are. Recently making the rounds online was the story of an illegal El Salvadorian woman with a benign brain tumor. The sensational headlines and carefully worded stories would cause any casual reader to believe the woman was callously abducted from a hospital by ICE agents having little regard for her well being. A careful examination of the information through multiple sources however, reveals the story is much less sensational and a lot more humane than what many of these authors intend for their readers to feel. In reality, the woman was already detained by ICE since 2015 and became ill while in custody. Agency officials then admitted her to a hospital for care while still in their custody just like any other jailed criminal who has a medical emergency they’re unequipped to handle. The agents didn’t place her back into the detention facility until after her physician explicitly informed them she was stable and could be removed from the hospital. Of course to read all about it in the headlines, one would think an egregious ethics violation occurred. You’re lead to believe she was carelessly ripped out of a hospital just before receiving life saving treatment. Nothing could be further from the truth. This, and many stories like it are what has lead the DHS to create their Myth Vs. Fact page. Essentially stories like these are also why President Trump decrise the media as the “enemy of the people.” In his recent interview with Fox News anchor Chris Wallace, Trump reiterated his “fake news” characterization of the press. An entirely clueless Mr. Wallace chided Trump for only holding disdain towards what was characterized as “unflattering coverage” of his presidency. As President Trump explained though, it’s not about the coverage being unflattering. It’s about the coverage being untruthful. What Mr. Wallace doesn’t seem to grasp is that the accusations of dissembling journalism run amok in the country today isn’t even about the president. It’s about the media’s unilateral perversion of half truths, and their antithetical prevarications relegating the masses to darkness, doubt, and ignorance all while cloaking themselves in the visage of virtue predicated upon their moral culpability. It’s difficult for a rational thinker to conclude that these obviously biased journalists aren’t attempting to subvert trust in the rule of law when those elected to execute those laws are diametrically opposed to their own questionable sociological ideology.